Tweaking your outfit to suit the occasion could soon be as easy as moving pixels on a screen. "Apparel," the first garment to exist in both the physical and digital realms, is designed to take us one step closer to that future. Developed by Normals, a design collective from France, the garment uses a combination of augmented-reality technology, custom-coded applications, and personal data to create a "wearable avatar" primed for a game of digital dress-up. A cloak-like covering, Apparel has two incarnations: a polygonal computer model and its real-world counterpart. 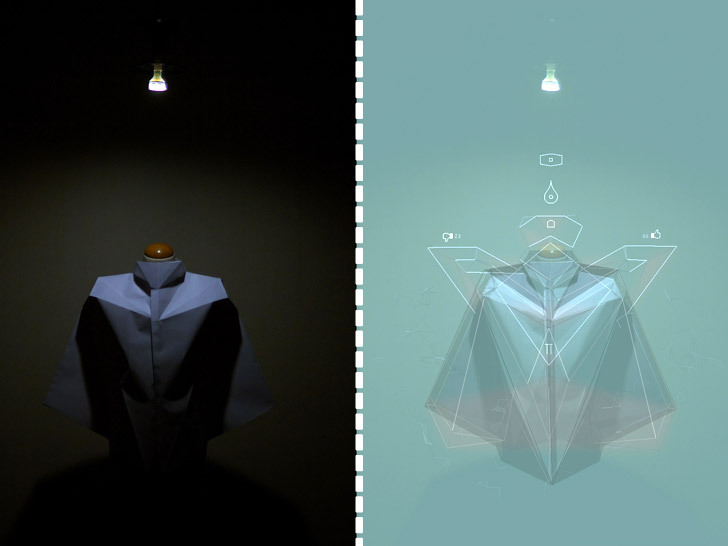 By manipulating the virtual version using a range of parameters, then viewing the physical garment through a camera on a computer screen, the user is able to visualize the changes in real time. By manipulating a computer model, the user is able to visualize the changes on the physical garment in real time. “There’s a big chance your next evening dress will be a 3D computer template,” Normals says. While the group has no immediate plans for a large commercial release, they are open to creating limited, customized editions. Eventually, a version of Apparel may turn up as a mobile application, one that harnesses a smartphone’s camera to display a three-dimensional object that morphs with information gathered from its environment. A cloak-like covering, Apparel v.0.93 has two incarnations: a polygonal computer model and its real-world counterpart. By manipulating the virtual version using a range of parameters, then viewing the physical garment through a camera on a computer screen, the user is able to visualize the changes in real time. Although the Normals plan to pursue all manner of "future scenarios and hypothetical objects," Clément Chalubert, Aurélien Michon, and Cédric Flazinski are particularly interested in the idea of fashion as an expression of individuality. “Apparel explores how online representation (profiles, avatars, etc.) meets real-world representation, a.k.a fashion, and for that matter, any object meant to display one's individuality in public," they tell Ecouterre. "We like to talk about the notion of 'wearing one's own avatar.'" While the group has no immediate plans for a large commercial release, they are open to creating limited, customized editions. Eventually, a version of Apparel may turn up as a mobile application, one that harnesses a smartphone's camera to display a three-dimensional object that morphs with information gathered from its environment.